It’s hard to believe the holidays are already here! Let’s celebrate with yummy food and fabulous #BlackFriday2018 photo offers! After having three girls of my own, I firmly believe that every woman should celebrate her pregnancy and life with a newborn with beautiful photos to treasure forever. You always think you’ll remember these days, but the truth is – you won’t. Even memories of the big moments in life, like when you’re expecting your first child, fade away after a while. Eventually, it will get harder to remember just how perfect your baby bump looks in your favorite maternity outfit. And, believe it or not, you might even have trouble recalling exactly what your newborn baby looks like – especially if you have more children! There is a certain facial expression my oldest daughter has made since she was born, with her little tongue poking out between her lips. Not only can I look back on her newborn photos and see that exact same look on her face, but it’s also there in pictures we’ve taken since then. It’s these tender little things that only mamas remember. But I know that, as she and her sisters grow, I might even forget that trademark look of hers! It’s just one of the many reasons I’m so thankful to have newborn photos taken of all of my girls. Those sweet moments are forever frozen in time so that I won’t forget what life was like as we welcomed each tiny baby into our family. 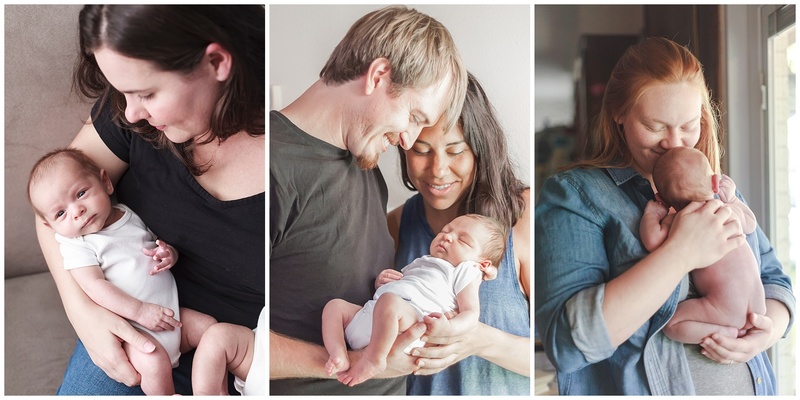 Inviting someone to capture your pregnancy and new baby is a big decision. Being in front of the camera makes a lot of people nervous… and you want to make sure that your photographer will document these memories in a meaningful way. After all, you can’t get these moments back. That’s why I focus exclusively on maternity, Fresh 48 and in-home newborn portraits. I’ve made shooting baby bumps and tiny newborns my specialty so that all of my time, attention and passion goes into photographing the most beautiful part of motherhood. From one mama to another, I understand how priceless these moments are! You want to look back on your maternity, Fresh 48 and newborn photos and see yourself as you really are. Crazy in love with your husband and so excited about this new adventure ahead of you. Thankful to be counting ten tiny fingers and toes just hours after baby is born. Thrilled to be cuddling baby in the nursery you spent hours decorating just for her. My photography style captures the authentic connection and genuine emotion of big moments like these in ways you’ll love for a lifetime. That’s why #BlackFriday2018 is the perfect opportunity to make sweet memories of your pregnancy and the birth of your baby. I’ve created two special offers that make celebrating this time of your life a little easier on your budget – without compromising on making lovely memories! There are only five sessions available at this special pricing – and once they are gone, I won’t offer any deals until next year! Get all of the details here and book your #BlackFriday2018 maternity, Fresh 48 or at-home newborn session while these offers last! I specialize in maternity, Fresh 48, in-home newborn and family portrait sessions in Houston, Texas. A luxury photography experience is the perfect way to celebrate that adorable baby bump and your sweet newborn. If you’re ready to chat about a magical photo session celebrating you and your baby, click the button below to get started! I’ll send you a beautiful Welcome guide filled with all the details! © 2019 Kristal Bean Photography | All rights reserved.